The Jamaica NOW Leadership Council meets on a quarterly basis. The remaining council meetings will be held on March 8, 2018 at 6:00 PM, May 17, 2018 at 6:00 PM, and June 21, 2018 at 6 PM. Meetings will be held at the Queens Borough President’s Office. The Jamaica NOW Action Plan, released in February 2015, identified 26 strategic actions to guide catalytic investments for the revitalization and growth of Jamaica as a thriving destination. Click on the link below to see the Jamaica Now action plan update. The application process for the Jamaica Now Action Plan Leadership Council will begin on April 30, 2017. Continued collaboration with community stakeholders is essential to ensure the Plan fulfills its mission. To this end, Queens Borough President Melinda Katz has created the Jamaica Now Leadership Council consisting of a diverse group of stakeholders to monitor the plan’s implementation, provide oversight, and participate in the evaluation of the action plan. The Leadership Council will be led by community stakeholders, with the support of City Hall, and will meet no less than four times per year over the duration of the Action Plan. The Jamaica Now Leadership Council’s work is completed through subcommittees and non-Leadership Council members are elected annually. Brian Browne (St. John’s University); Ricardi Calixte (Queens Economic Development Corporation); Tonya Cantlo-Cockfield (Jamaica Center for Arts and Learning); Kevin J. Forrestal (Queens Community Board 8); Deepmalya Gosh (The Child Center of New York); Glenn Greenidge (Sutphin Boulevard Business Improvement District); Michael Griffith (New York City Department of Transportation); Ian Harris (Community Board 12); Howard Hecht (Community Member); Derek Irby ( 165th Street Mall Improvement Association); Malikka Karteron (Resident); Michele Keller (Queens Community Board 12); Tameka Pierre-Louis (Civic Leader); Justin Rogers (Greater Jamaica Development Corporation); Pierina Ana Sanchez (Regional Plan Association); Aaron Schwartz (Commercial Property Owner); Earl Simons (York College); Nakita Vanstory (LaGuardia Community College-Justice Community Program); Richard Werber (King Manor Museum); Jonathan White (Community Member); Montgomery Wilkinson (Resident) and Tajuana Hamm (Designee for NYS Senator James Sanders, Jr.). 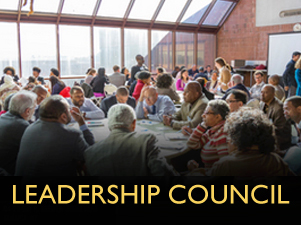 The Leadership Council also includes the following Ex-Officio Members: U.S. Representative Gregory Meeks; State Senators Leroy Comrie and James Sanders; Assemblymembers Vivian Cook, Michele Titus, and Clyde Vanel; Councilmembers Adrienne Adams, Rory Lancman, I. Daneek Miller and Donovan Richards. 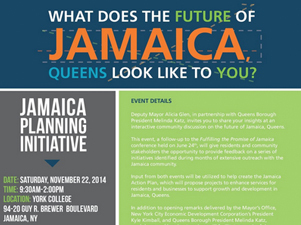 The Jamaica Now Action Plan unveiled in April 2015 outlines 26 strategic actions for the revitalization and growth of Jamaica, Queens into a thriving residential and commercial neighborhood. 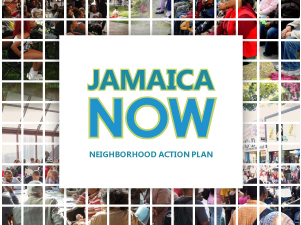 The Action Plan is a culmination of the Jamaica Now Planning Initiative and is designed to address the challenges that have faced the Jamaica area in recent years by providing workforce training and small business support, initiating new mixed-use development anchored by affordable housing, and improving the livability of the neighborhood through investments in safety measures, green spaces, and more. The 26 strategic actions, 16 of which will be launched and implemented between 2015-2018, are backed by substantial public funding. The initiative was started by the Queens Borough President Katz and the Deputy Mayor for Housing and Economic Development in Spring 2014 and aimed to identify community priorities and create a coordinated and equitable community economic development strategy. The Initiative engaged community and elected leaders as well as encouraged inter-agency collaboration over the course of over 30 meetings and two public conferences, culminating in the creation of the strategic Jamaica Now Action Plan. A neighborhood-based, local stakeholder-driven approach to community development, the Initiative brought together community residents, not-for-profit and faith-based organizations, private firms, and industry experts with policymakers and city government leaders to discuss priority issues, opportunities, challenges, and project ideas to strengthen the neighborhood of Jamaica, Queens.